Launched in 2005, Indigo Delicatessen has defined the quintessential Deli experience in India over the years. With accolades and awards, and many a ‘firsts’ along the way, the Deli developed a tradition of delighting guests and building a patronage. It originates from the house of deGustibus Hospitality, the pioneering company that gave shape to the iconic Indigo Restaurant in Mumbai and had re-written the rules of luxury dining in India in the early 2000’s. Indigo Deli is an all-day café that offers its guests a comfortable and friendly atmosphere with an extensive and absolutely scrumptious menu consisting of contemporary Western Comfort food, cooked using an array of techniques and practices – mostly European and American. The fare can be best described as honest, unpretentious, good food, cooked from the heart with local sustainable produce. Each Deli is unique, with a certain central focus that defines the space. Yet, there are several aspects across the Delis that bind them. The colours and tones used within each of the Delis lends to a sense of comfort and warmth within the space and adds to the overall experience. This is mimicked by the friendly and attentive service received during the course of every dining experience. After winning the hearts by opening its flagship outlet in Pune at Phoenix Marketcity Mall, They have opened their second outlet’s door at Koregaon Park. I was invited for the Food tasting of this outlet. The menu remains the same but, the love they spread while serving their scrumptious food has already taken the foodies to the next level. We started the Evening with a little chat with the Chef Tushar and we also discussed the Positive vibe this place has. The place is done so well, It has a feel of old English cafe on a busy streets of London, With wide clear windows and the table attached to each which gives a glimpse of the road. It has up class high head leather sofas with a lot of head room overall makes this place a unique for a Sunday Morning Breakfast. The evening was set with specially curated menu by the chef himself, and he knows how to keep the patrons happy. Amuse Bouche: It was Potato & Leek with Chive Sour Cream and the Golden Fried Leeks. This was warm and soothing served in a Cup. Salad: This was a freshness overloaded salad with Kale, Fennel, Apple Batons added the little sweetness, Dried Cranberries this added sourness, Feta & Candied Pecan nut for the crunchiness. Perfect way to start your dinner. Pizza: 3 Pepper & 3 Cheese Pizza: IndioDeli is the only place where you get the wafer thin crust, I really mean wafer thin crust here!! Perfectly baked without spoiling the crust. The 3 Cheese were cheddar, scamorza and mozzarella and 3 Peppers were Red, Yellow and Bhavnagari peppers. Combination of all six gave a perfect level of spice and good amount of cheese to make this a complete pizza. SDT Olives and Capers: Little sour with little juice in the Sun Dried Tomatoes(SDT) along with Black olives and Capers, these are basically the edible flower buds (capers), often used as a seasoning, and the fruit (caper berries), both of which are usually consumed pickled as well. The SDT are homemade to get the perfect quality of the tomato. Spinach & Jerusalem artichoke Ravioli: Jerusalem Artichoke is also called sunroot, sunchoke, earth apple, or topinambour. Ravioli was served with blistered cheery tomato, Crispy basil and bell pepper puree. These Ravioli were very delicate yet they were holding the stuffing very well. Lemongrass Kaffir Lime Steamed Rawas with Cilantro- Black Olive Gnocchi Sauteed shitake and charred corn: As Chef wanted me to try the vegetarian version of this so with his magical cooking skills he took off the Steamed Rawas and made me a Veggi version. This dish was highly appreciated on the table by the non-vegetarians and it was swiped off within minutes. Desserts: Indigo Deli offers excellent varieties of desserts including multiple options of homemade ice-creams. We tried almost all the Desserts including Apple Pie, Chocolate layered Almond Cake, Chocolate Mud Cake and Blueberry Cheese Cake. All were just awesome. A big Shout out for Svetlana for Invitation and Chef Tushar, Saptadeep and Team Indigo Deli (KP) for hosting us. Address: 26/3A/2 Power Point UG 3, Lane Number 6, Koregaon Park, Pune. The Dream Kitchen is situated on 8th floor in Konark Icon Magarpatta. The restaurant has a Dhaba style setup with overlooking the lush green surroundings of the complex. It has a semi open kitchen which gives us a open feeling while enjoying the food. Recently I was Invited for the tasting of their delicacies. We started with some nice and thick Punjabi Lassi followed by some mouth watering appetisers. Mozzarella Cheese Sticks: A very unique appetiser, googy cheese stuffed with shallow fried coating with with home made punjabi spices. Very nicely plated. Afgani Chaap: Chaap is the minced soya which is also called as false meat for the vegetarians. TDK has many such varieties of Chaap to offer. This was Moist and creamy in taste. Not too spicy not too bland perfect taste. Dahi de Sholay: This is another gem from the TDK, Main ingredient s the hung curd mixed with finely chopped veggies which are stuffed in a coating. Taste the best when you have it hot and it was nicely plated. Chatpati Chaap: One more unique dish, slightly chewy but nice mixed taste of chaat and the spices gave a nice tingling taste on the taste buds. Chaap Rogan Josh : This a Vegetarian version of Mutton Rogan Josh. Minced Soya is cooked with the home made authentic ground spices, which gives the gravy nice brown colour and the aroma is also very nice. TDK Sp. Paneer: This subji is gravy is rich as well as spicy with Mouth melting paneer chunks along with finely chopped veggies. This is a must have in the mains. This is the creation of the owner himself as he is chef by profession. Dal Makhani: Its Slow cooked overnight dal. Perfect in thickness and the rich in aroma. Three types of breads were served as per the Subjis : Laccha kulcha, Kesari Paratha, and Naan Changezi. Special Mention to Naan Changezi, this is one of the out of the world bread which has dry-fruits on it and it goes well with TDK Sp Paneer. Gulab Jamun: Nice, Soft ad big enough to satisfy the sweet tooth. Kesar Wali Kheer: This was loaded with Dry Fruits and perfectly sweetened. Shahi Tukda: Crisp Bread slice dipped in a thick Rabdi drizzled with Rose syrup. 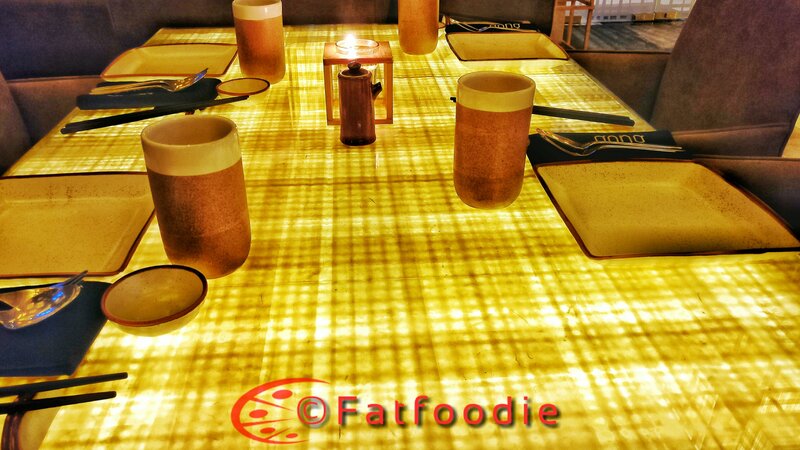 Its a nice place to have a good food with Dhaba style ambience with punjabi songs playing in background. Service is pretty prompt. Its a Value for money restaurant. A big Shout out to Karma PR for Invitation and Team TDK for hosting us. ​Sacred Chinese gongs are inscribed with the Mandarin Chinese characters called Tai Loi, which means, happiness has arrived. GONG- Modern Asian takes you to a new level of happiness with its high energy ambience that is a contemporary take on traditional Japanese temple architecture and diverse Asian flavours that are prepared using western cooking techniques and presentations. The menu features a progressive mix of Sushis, Asian Tapas, Stir Fries and Curries – rolled, steamed, baked, fried, tossed or slow cooked. The cocktail concoctions make use of fresh and dehydrated fruits, herbs, spices and liqueurs to achieve a perfect harmony of flavours. The result is a perfect balance of ingredients and textures that are all a testimony to GONG holding the baton of innovation. GONG is a venture of Speciality Restaurants Ltd, the company behind favourites like Mainland China, Oh! Calcutta and Hoppipola. MD Anjan Chatterjee teams up with son Avik Chatterjee, who’s designed GONG to oscillate between an elegant dining space and a pumped up, high-energy bar. Ingredients from Thailand, Japan, Vietnam and its neighbouring countries jostle for space in the exhaustive menus. There’s a wide range of sushi, rolls and dimsums to spoil you for choice, and the long list of noodles and mains ensure that deciding what to order is a tough decision. I was invited for the tasting some of their speciality. We started with Amuse Bouche: The term is French and literally means “mouth amuser” It has often becomed a showcase, however, due to the artistry and showmanship of the chef, intensified by the competition among restaurants. They had a cranberry sphere Jelly type with basil crumble, followed by kaffir lime tofu. Nice mix of sweet and spice in one go. Asparagus Tempura: A Chef’s speciality. Young leafy tips of asparagus, tempura fried to a nice golden colour and rolled into a chumaki size sushi. Avocado inside and are topped with crunch. So delicious!! Cream Cheese Avocado: This was another gem from the Chef. Mouth melting Cheesy with Mayo dressing along with Asparagus and Cucumber were there for holding up. Rolled in Sushi rice. Served with WASABI, Tender and sweet Thai Ginger. #MustHave. Edamame and Truffle Dumpling: These little babies were tender soft, silky and shiny. Along with this to add some spice and enhance the taste they had given us some authentic Dipping Sauces. Crispy Vegetable Cheung Fun: This cheung fun is one of the more untraditional dishes, mixing the textures of the soft cheung fun skin, the crispy beancurd sheets and the Veggies filling. I loved this! No wonder its the Gong’s most favourite dish. Burnt garlic fried rice with vegetables in Chilli basil: This is the only restaurant where I liked the Fried rice, nice and flavourful with burnt Garlic. Vegetable tossed and served with Chilli Basil sauce. Stir fried Noodles: Good in taste Finely chopped veggies added to it. Chocolate Dome: One of the fancy items from the menu. Big Chocolate Dome is placed and Hot Chocolate Sauce is poured over it to uncover the hidden gems like Brownie cubes, Crispy honey flat noodles, Some Popcorns, and a Scoop of Vanilla Ice-Cream. #MustHave. Malaya Spiced Melon and Hot Guava Punch: Its bit difficult to decide between both but Hot Guava Punch is my favourite. Gong takes you to the Journey of Asian cuisine along with some latest Molecular Gastronomy techniques and which embellishes the overall dinning experience. The Interiors of the Gong makes this journey Magnetic and Delightful. A big Shout out to Shweta from ESOL and Team Gong for Invitation and hosting us. Culture पुणे: This is a new kid on the block of the hangout joint along with good Cocktails to go with. This place has come up at the same spot where the By the Way restaurant use to be there. The interiors of Culture Pune has kept the Rustic and Rugged looks with vintage switch boards, naked brick walls behind the Bar counter. #TheBteam was invited for the tasting of some of their signature cocktails and signature dishes. तुळशीबाग-Basil Garden: Fresh melon infused with Basil and Vodka served in a Copper Kalash (ताम्बिया). Rum में है दम: Loaded with all types of rum White, Dark, Coconut Rum mixed with orange and lime juice served on the ice. Baked Cauliflower with Fried Garlic: This was bit disappointing dish. overall baking of the cauliflower was not good. It was just cheesy and it was served with Gralic bread. Burnt Garlic Veggies: Veggies tossed in Garlic sauce along with Hakka Noddles Again this didn’t suited for my palate. Ratatouille Pilaf: European version of veg Pulao. Slow cooked with seasonal veggies tossed with mixed herbs and aromatic Mediterranean rice with butter. This was something good from the mains which I liked it. Nice flavourful in taste bit tangy and spicy as well. Good to try out for the mains. Old Monk Mousse Shot: Chocolaty in taste, delicate on the tongue, with a kick of old Monk. Nice for the sweet tooth. Creme Brulee: Homemade custard with crystal clear caramel torched to the perfection. #musthave. Apart from some teething issues with the service and staff the variants of the cocktails they offer is good which can be clubbed with good starters. SHEESHA is an restaurant serving authentic North Indian Cuisine especially Awadhi and Muglai Cuisine. Menu is filled with exquisite and carefully selected dishes which are subtle yet daring. Only restaurant in Pune to introduce Nawabs of Awadh for their love of music, dance, of epicurean delights and of grand gestures. And the good news is that they have Sheesha with many flavours to choose from. Talking about their Food they try new and old recipe, experimenting and innovating to keep up with the race. Internationally acclaimed, EX-ITC Chef Kader Khan founding partner of sheesha all the way from Lucknow brings you the different taste of flame whose experience has crossed a silver jubilee in making 386 different kinds of only kebabs. I was the part of First Bloggers table held at Sheesha Pune. Ambience: Restaurant have huge space. They have three option of sitting the regular Tables and chairs, second one is the cabana style sitting for small group or family and the Round table with separate area. As we settled down, we started with some mocktails followed by the starters to cool down ourselves. Soup: Tomato Sorba: Basic Tomato shorba nothing fancy about it. Cheese Corn Kurkure: Deep fried stuffed with googy cheese and corn was good to start with. The cover was enough crunchy to hold the cheese and with the first bite the cheese was oozing out. Makai Malai Seekh Kebab: This starter was served on a sizzling hot plate. Nice and mouth melting Keba, distinct in taste and aroma. Paneer Shashlik: Again this was served on the sizzling plate. Flavoursome Paneer mixed with roughly chopped vegetables which were tossed in a tangy tomato base puree, this give a nice colourful presentation. it was bit over fried which tend to lose the tenderness of the babycorn. There was huge spread from we had to choose, which made our task bit difficult. The main course was much better than starters. Tawa Sabz Banjara: This was the winner of evening. Perfect in taste, Spiciness, rich in aroma, roughly chopped vegetables served in a flat tawa style plate. This goes will with Butter Garlic Naan. Dum Aloo Nawabi: As the name suggest, Soft Dryfruits stuffed dum aloo cooked in Cashew gravy and cooked in rich creamy gravy to get the perfect consistency. Dal Bukhara: One of the best dal in the town, slow cooked for hours to get the thickness without adding any thickening agent which can be felt right from the first bite. This goes well with Kadak Roti and Jeera rice. Veg Biryani: Moist, Flavourful, rich in aroma, perfectly cooked with equal amount of spice.Vegetables were perfectly cooked and chunky. No issues at all. Avadhi Lasooni Kheer: This was something unusual in the dessert section so we ordered that. Basically it was Kheer with very finely chopped garlic mixed with the kheer. If you don’t like garlic’s after taste, then this dessert is not ment for you. It’s different and unique. Gulab Jamun: Small in size soft and dipped in sugar syrup. Overall a good experience apart from some teething issues. And of course they serve different flavours of Sheesha and they have weekly Sufi nights to enjoy along with good food. A Big shout out for the Shivangi from Carpe Diem for invitation and Team Sheesha for hosting us. I was for a complimentary food tasting event. This blog is a narrative of my experience at the event. These are my views that I have expressed in the blog. Others are most welcome to agree or disagree with the same.